The Chance® Company of Centralia, Missouri, produces a modular piling system for structural foundations that can be used in a variety of situations. Typical piles are monolithic and require installation by heavy equipment, which can be disruptive to neighbors and nearby buildings. The Helical Pier� Foundation System and Helical Pulldown Micropiles� are designed for easier and less disruptive installation in tighter spaces. The Chance® Company tasked JAR Associates to develop an automated methodology to analyze the piles under combinations of vertical and lateral loads in varying soil conditions. Pile installation could be vertical or slightly angled. Soil stiffness was based on standard non-linear response formulas of Reese and Matlock. Chance® helical anchors comprise steel shafts and helices of steel, selected for specific installing torques and design loads. The helical lead, with geometry similar to a hole augur, is screwed into the ground. Steel shafts are added to extend the depth of the pile. The shafts are coupled together as if they were extensions on a socket set, except the shafts are between 1.5 inches and 2.25 inches square. The pulldown micropile concept adds a large washer behind the helical augur at a coupling of augur to shaft or shaft to shaft. As the pile is screwed into the soil, the washer clears a cylindrical space behind it that is filled from a surface grout reservoir. Once the grout cures, the Helical Pulldown Micropile� is effectively a reinforced concrete pile. The top of the shaft or multiple shafts can be joined in a pile cap, or attached to a foundation with brackets that can be hydraulically adjusted for remediation of settlement. JAR selected the ANSYS program to implement the methodology. ANSYS has an embedded programming language, APDL, that provides direct calls to ANSYS menu choices and database information. APDL looks and functions like an interpreter (Fortran) as well as providing the necessary extrinsic function access to ANSYS. Because the modular pile system has a variety of leads and shafts in multiple sizes, a similar modular approach to FEA modeling was chosen. 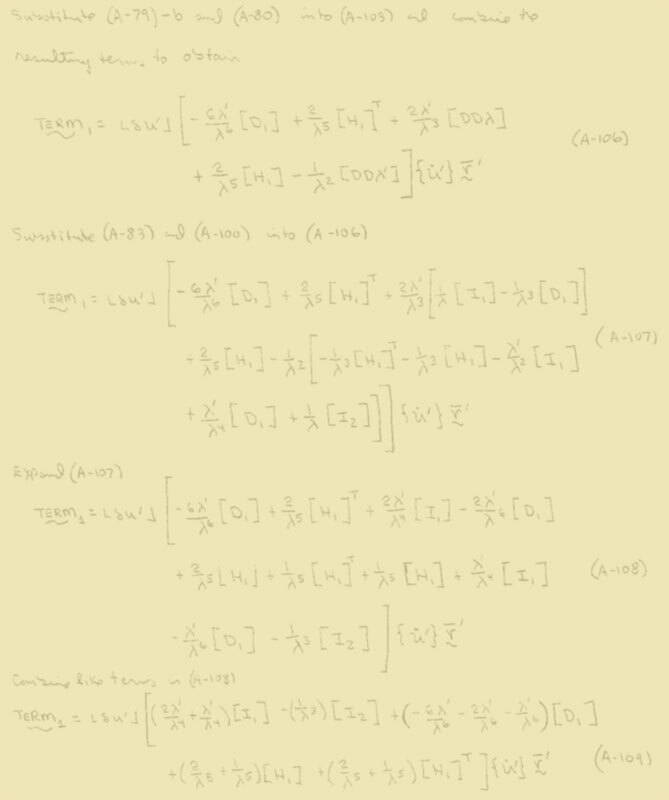 Each component was assigned a specific finite element discretization. The components were selected from a toolbar and checks were done to assure that only feasible assemblies could be created. 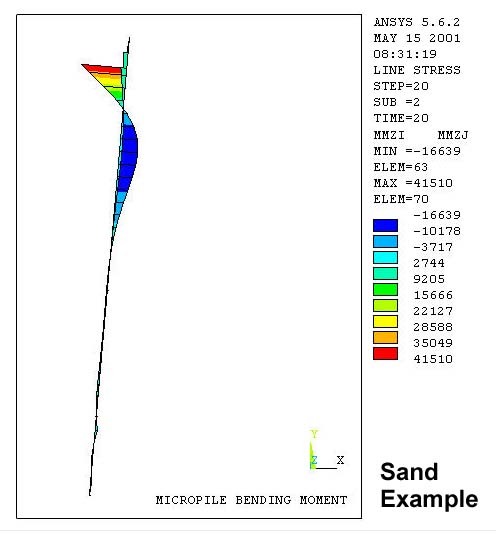 With the addition of shaft size and soil characteristics, a model of the pile as a beam on a non-linear foundation was created, and lateral and vertical loads were applied. 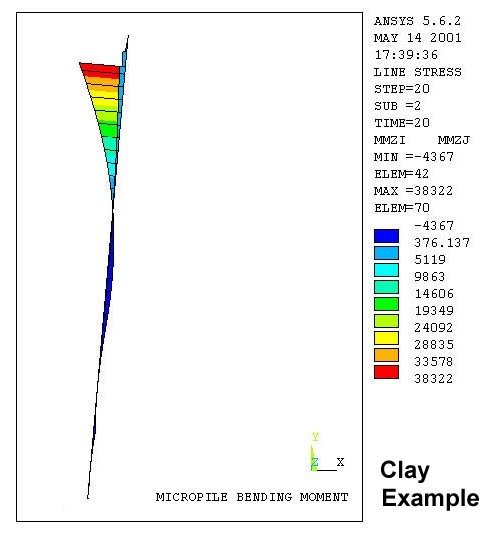 For this type of analysis, the minimal required soil data is soil type (clay, sand, or mixed), depth of layer, and blow count. Additional soil data such as cohesion, density, and friction angle, will be used in the response formulas if specified; otherwise, default values are used based on the minimal input.